I have been speaking publicly on topics related to photography and national parks for more than 20 years. Venues have included conferences, companies, schools and universities, museums and galleries, photography clubs, etc.. I bring to each presentation passion, beautiful images, fun stories, and great information. Thanks for stopping by and considering me. If you want to check my availability for your event, or if you have some questions before proceeding further, contact me. My most requested presentation is Treasured Lands (details) with a proven track record of audience appreciation and inspiration. It is an account of my 20-year journey to photograph the 59 U.S. national parks in large format, from the origins of the project to the publication of my multiple award-winning book, with an extensive look at wilderness adventures behind the images from Arctic Alaska to the volcanoes of tropical Hawaii, and a few hard-earned photography insights. Including Q&A and a book signing, the event lasts between 1h30 and 2 hours. I am also happy to prepare custom presentations to meet your organization's specific needs. 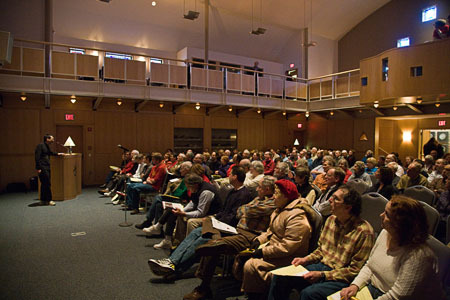 Presentation lengths can range from 45 minutes to all day seminars. Programs could include photography, travel and outdoors or a combination of both. "It was a pleasure to work with you on a second talk and very rewarding to hear your presentation. Treasured Lands: Journey and Visions was extremely well-received by the 187 of the audience. A great majority of them marked themselves very satisfied on the evaluation questionnaires we distributed." "Everyone really enjoyed it, and many said it was the best talk, yet." 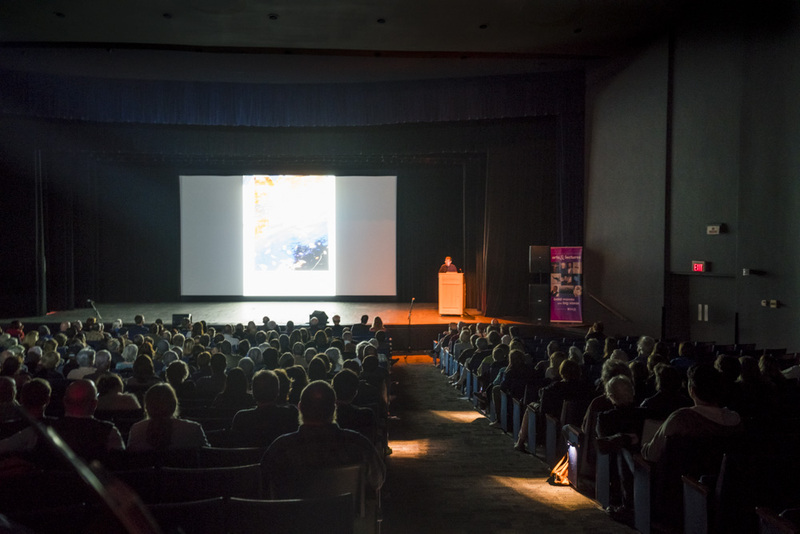 "QT Luong's presentation, Treasured Lands received rave reviews from a capacity crowd of 160 members of the Palo Alto and Bay Area camera clubs and local community. The audience was captivated by the humorous and exciting adventures QT experienced coupled with the spectacular photographs of the national parks. Thank you QT for a delightful and memorable evening. " "A very sincere Thank You for the personal time, effort, creativity, expertise and generosity that you provided the registrants during the recent NANPA Annual Summit in Reno, Nevada. The quality of learning and the appreciation of the attendees at your presentation, National Parks: Tropics to Arctic, was much appreciated." 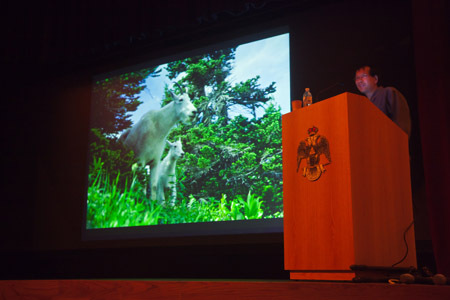 — Jamie Konarski Davidson, 2010 Summit Chair, North American Nature Photography Association. "Thank you for coming to Las Vegas and presenting as part of the Vegas Valley Book Festival. I appreciate you taking the time to enhance our community. Your work is absolutely stunning and amazing. " "He was wonderful in working with my art students... He was able to connect with the students in a relaxed manner and kept them interested and asking questions. His answers or descriptions often brought ahhs, laughs and more questions. The students were so respectful and seemed to sense that a really special, talented artist was in their midst. They listened with intensity and admired him and his work greatly... My students still talk about him and remember his stories." "thank you for your wonderful presentation. I have heard many, many members rave about your work. And, congratulations on your book. It is spectacular. One measure of how well received you were is the long line to buy it." "Counted 120 people. It seemed like more. It was a wonderful presentation! We really appreciated your doing it." "He presented many quite beautiful photos of parks, including some in a recently published book ('Treasured Lands'). He was also able to take good pictures of the recent lunar eclipse, as well as many fine shots from the big island, in Hawaii, including a lot of Mono Loa, lava streams, and other interesting features. We definitely recommend him for presenting nature photographs." "Thank you so much for presenting your wonderful talk to our Osher group yesterday. We were so honored to have you present your remarkable work... Thank you for all you do and for being in our community. We are so fortunate that you have shared your creative talents with us." "Very good presentation! Thank you so much for sharing your experience with all of us." "I would like to thank you again for your delightful presentation at The Villages yesterday — we had a good crowd and everyone was very impressed with you and your work." "Thank you so much for offering our community such a wonderful program." "Just want to tell you again how pleased we were with your presentation last week. I'm truly enjoying your amazing book!" "Exceptionally modest, incredible work and life story. Couldn't have been more down to earth and approachable." - Adam K.
"Excellent lecture and stunning photographs. It has inspired me to grab my camera and travel more in search of light and landscape! We must protect these precious landscapes!" - Vidya K.
"It was awe-inspiring to see someone so dedicated to capturing nature's beauty and sharing that so others can enjoy. I loved how casual QT sounded when he said Everyone went back, but I decided to sleep on the volcano overnight so I can capture some night time shots" - Alex S.
"Your story is so inspiring, and the camera and video work are stunning. Thank you!" - Judy K.
"Thank you for sharing your beautiful photos and your commentary to explain your visits and your photographic process. There are so many of the parks I have not visited and I felt part of their beauty." - Jacqueline G.
"Beautiful images and incredible journey through the National Parks. Thanks for sharing your adventures and images." - Marie S.